Last week, I wrote about the version of The Build Act that is currently working it’s way through The Senate (S. 2463). This week, fellow AVMA extern McKenna and I were able to meet one of the Congressmen who introduced The Build Act in The House (H.R. 5105)! Congressman Ted S. Yoho of Florida also happens to be a veterinarian and was great to talk to about The Build Act, his personal experience, and the role of veterinarians in the public sphere. 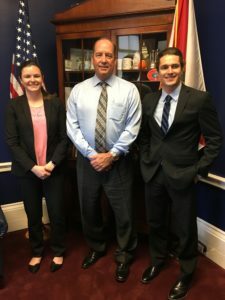 Congressman Yoho also had a lot of great advice for us regarding our careers as vets, emphasizing how important it is for new veterinary professionals to advocate for themselves and market their unique skillsets. While we didn’t get a chance to discuss student loans and federal repayment programs, it was interesting to hear about the way Yoho works in congress and how his colleagues value his expertise as a veterinary medical professional.